It was cloudy in the morning but not raining so I packed up and made the difficult gear transfer down the slippery rocks to a flat muddy area at the bottom with eelgrass. This little island is actually connected to the main island at really low tides. There was a wide diversity of marine algaes / seaweeds here, exposed at low tide. As I was finally getting ready to go, the rain picked up, but that was okay because I was in my drysuit. I came prepared! I immediately crossed over to the north shore of the inlet and began searching for a creek from which I could fill my water bottles because I was getting very low. I wanted a little stream, not a raging river, since the stream would be groundwater that I wouldn’t have to filter. There were tons of streams with all the rain; it was just a matter of finding one that was easy to access. I came upon this nice beach with a little creek running into the sand. I used my underwater camera housing because it was so rainy, so the pictures are all blurry. That's where it came from -- perfect! A fishing boat went by as I started off again. I went past another beach with a big raging creek. The rain started to taper off so I pulled my head out of the drysuit since I was getting too warm. 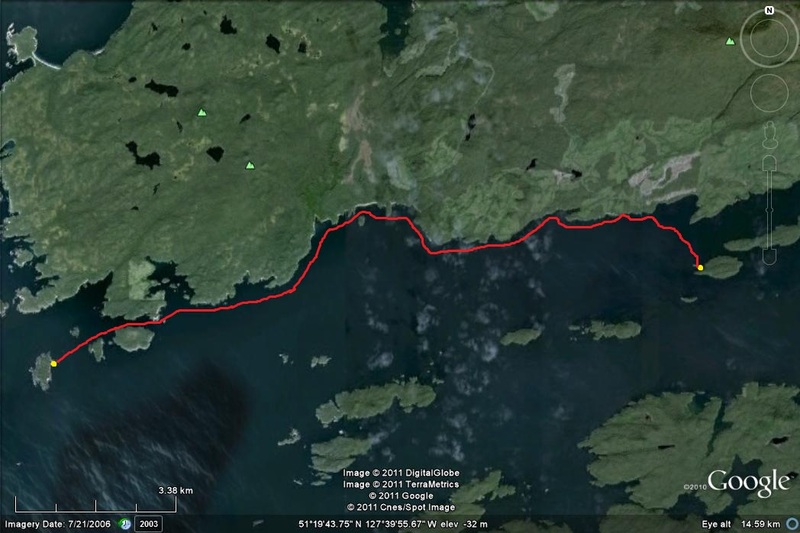 I continued on for a while, following the interesting shoreline as I moved west towards the open ocean. I came upon a bay with a large brown sandy beach and I went in to investigate. There was a succession of about four of these beaches, really nice. I don't know how easy it would be to find a spot to camp above the tideline though, with these midnight super high tides. But the water was very brown from all the runoff. I almost thought it might be an algae bloom. One of the sources of brown, a tea-like raging stream, with goops of foam drifting away in the salt water as it entered. Streams of foam. The sea water here was like tea. I came upon another of those interesting floating logs. My destination was a little island out at the mouth of the inlet, where there is supposed to be a beautiful sandy white beach on the lee side of the island. As I was reaching the end of the mainland before heading across to the islands, a final bay presented this interesting sight -- a zodiac full of people in survival suits paddling to the rocks. I didn't know what to make of it. In retrospect I probably should have gone over to see what was going on, but they didn't gesture for me. And they had nice yachts anchored just to the left of here in the sheltered bay. I donned my drysuit again as I crossed over to the islands, especially since the weather was staring to close in. I crossed over to Brown Island as the rain started pelting down. As I was approaching I startled a pair of sea lions about 30 feet off the bow. The problem was that there was a lot of waves here and landing on this beach wouldn't be simple given all the rocks just below the surface. I paddled over to the left and found a spot that might allow me to land. I waited until a break in the waves and then raced in over the reef in a foot of water. Just as I was landing a big wave came up behind me and if I hadn’t been perpendicular it probably would have knocked me over. I pulled out ASAP. The beach was brilliant white crushed shell. I played with my underwater still camera in the tidepools. This is a green surf anemone, which only grow in the tidepools on the exposed west coast. They can also dry out for short periods too. Usually these half in / half out shots are in tropical locales with coconut palms above and coral reefs below. It was still raining and I got a little sleepy so I took a nap by lying on a log in my drysuit. It was very comfortable, just the right temperature to be lying in the rain. Then I took my drysuit off, and now it wasn’t so warm! Those things really work. This beach had a beautiful little wildflower meadow of primarily coastal strawberry, but also lots of other interesting plants thrown in. Here is Indian paintbrush. I decided to set up the bat instead of the tent and sleep on the sand because the bugs didn't seem too bad. I lay under the tarp and had a nap for a couple hours and collected this much water off the drip. I hope there aren't any toxins leaching into the water. Some abalone shells, or "mother of pearl". I did a little garbage cleanup and surprisingly there was very little. I even pulled out my computer to check Google Earth and to charge my GoPro cameras and download photos. I didn't know if I'd have sun again to charge the GoPro's so I decided to sacrifice my computer's battery. The sand wasn't a problem at all because it was the perfect size -- large enough that it doesn't stick to everything and get everywhere. This entry was posted on August 10, 2011 by markbc. It was filed under Uncategorized .